outside your house,” Kupsc says. JAREK KUPSC, 43, lives in Los Angeles, as of February 2009. Born in Warsaw, Poland, Jarek has been involved in independent film production since 1983. He studied art and history in his native Warsaw, Poland, learned Byzantine Icon painting techniques in Greece, and received his B.A. in Film Writing/Directing from San Francisco State University. He authored and illustrated "The History of Cinema for Beginners," a comic film history textbook (Writers&Readers, New York/London, 1998). 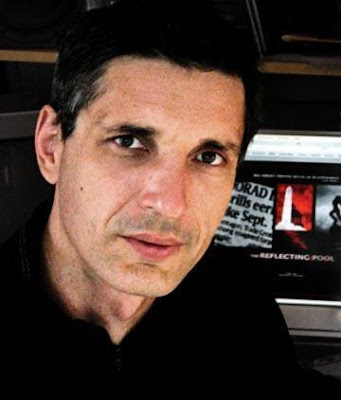 As a writer/director/producer, Jarek completed numerous short films, including the Rosebud Award-winning "Dog." He debuted in 2001 with "Recoil" in the feature film category, following with "Slumberland" in 2005 (Winner of Special Jury Prize, 2006 Gdynia Film Festival, Poland; First Prize, 2007 Oskariada FF, Poland; Best Screenwriter, 2007 Young Film Festival, Poland.). He is the writer/director of the 9/11 film "The Reflecting Pool." “For anybody born and raised behind the Iron Curtain, it wasn’t difficult to realize what you were getting from the television, newspapers and the media did not exist outside your house,” Kupsc says. To win something be the last person to correctly answer the following. "All of the above, except (b), (c), (d), and maybe (f)." NAD: Jarek, hello, thank you for taking the time for this. What do you think of the press in the United States? I think the press provides the pictures, and the government provides the wars. It's a perfect union, from the corporatocratic perspective. I don't read anything in print anymore, except Rock Creek Free Press. I get my information from a wide variety of websites, which I cross-reference obsessively to make sure the facts hold up. Sometimes I consult www.whitehouse.gov, verifying the insidious laws and orders they keep passing and publishing on their website for the world to see, without any apparent interest from the corporate media. NAD: How about films? Can political films be made here? I suppose there are tons of political films being made by independent filmmakers, right? I made a political film, alright. I tried to make an honest film about an event that shaped our lives in this century, and is likely to influence the next several generations. Dealing with 9/11 in an open forum is nearly impossible in the U.S.
You can do it under the radar, as most political films are being produced. But if you want to do a mainstream, populist film, you have to follow the official line, say, like "United 93," for example. So, propaganda is being awarded, while honesty is relegated to the underground. Of all the documentaries made on the subject, none has received theatrical release. Those movies, including ours, which is a narrative, were made with little money fronted by the filmmakers themselves, so it's a losing proposition, financially speaking. Of course, nobody who is interested in truth is trying to get rich. In fact, the search for truth is the easiest way into bankruptcy. I guess, that's democracy for you. NAD: Why don't they get into the Cineplex 34? Not good enough? "The Reflecting Pool" has won some nice awards, but all big festivals have turned it down, except one in Poland. We cannot find a distributor to open the movie in theaters. We had to rent our own theaters to show the film in NY City, and other places. Same goes for the DVD, which we are self-distributing with some success. Without any push from some established critics or an honest distributor any movie dealing with an uneasy topic is bound for relative obscurity. Luckily, the Internet helps, as it propelled "Loose Change" to great notoriety. The press is not helping much, refusing to give these movies good reviews or at least talk about the subject matter without any bias. Blogs and independent news sites help, but it is still not nearly enough to reach the Bible Belt and beyond. What caused you to want to make it? 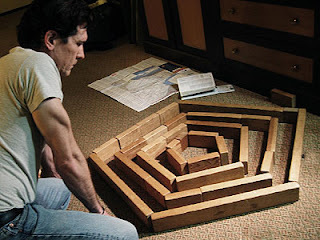 Any idea how many people have seen it? 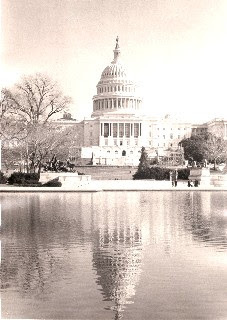 I made "The Reflecting Pool" because someone had to. I waited for that someone, and it didn't happen as of 2005, so I decided to go for it. At the time, it was the first investigative drama about 9/11 told from an honest perspective. I was angry at the success of corporate media with propagandizing the official lies. From that angle, our movie is about the pursuit of truth and the cost one must pay for it in today's America. On the seventh anniversary of 9/11, I decided to post the movie for free on Google Video, and we've gotten close to 10,000 hits so far. Since we opened the movie in February 2008, in theaters and screening rooms, we reached about 2,000 people, plus another 4,000 with the DVD. I've been very encouraged by the reception we've been getting. Even though we are mostly preaching to the choir, still, the audiences are uniformly grateful a movie like that was made. Unlike documentaries, "The Reflecting Pool" engages you emotionally as you follow the development of two main characters and share in on their struggle to overcome these insurmountable odds while dealing with 9/11. I appreciate how our audiences get involved on a visceral level with the story. I think the movie gives people the permission to experience these very uncomfortable emotions and thoughts: how the government is lying to you, how the media is providing a channel for the lies, and how the industrial/congressional/military complex is truly getting away with murder. You don't get that from cable TV or satellite radio. I'm trying to narrow my research and interests to strictly terrestrial affairs. Having said that, I think the movie "Capricorn One" is terrific. I didn't see him there with a sledge-hammer, so I'm not sure. What I'm sure of, most of his cabinet members were directly responsible for providing security to this country, and were in the position to prevent the attacks. I firmly believe their failure to act and prevent the attacks is a clear indication they have masterminded the September 11th events. It testifies to their complicity in confusing the Air Defense, and the reluctance to act on multiple warnings. The money trail between Pakistani intelligence, ISI, and Atta, as well as the fact the alleged terrorists received training on secure U.S. military bases, and at a flight school connected with Jeb Bush, all point to the Made It Happen On Purpose scenario. The list goes on and on. By contrast, there is zero evidence suggesting the attack was perpetrated by 19 hijackers with box cutters. Unless, of course, you believe in the intact terrorist's passport found in the WTC debris, where one-third of the human remains could not even be identified. And did I mention Building Seven and Mr. Larry Silverstein? Just like the suicides of Bruce "Mr Anthrax" Ivens, Deborah "DC Madam" Palfrey, and the recent plane crash of Mike "Mr Email" Connell. Are you trying to suggest we have some renegade assassination squad going around the country, taking out people whose testimonies could topple our government? All there is to know about Oklahoma City, is that the investigators found a second, unexploded bomb, and possibly a third explosive device in the debris. Now, how this could be done by Mr McVeigh, I don't know. Apparently, neither does the government, because the live TV reports on the other bombs in the building were broadcast only on local networks, and censored from reaching the rest of the country. So, as far as America is concerned, a maniac with a bunch of fertilizer took out the Murrah building. Scientifically speaking, I subscribe the the expert opinion that such tremendous damage to the building could not have been caused by that type of an explosive. (John Culbertson, "Case Study Relating Blast Effects to the Events of April 19, 1995, Alfred P. Murrah Federal Building, Oklahoma City, Oklahoma, utilizing test results from: Armament Directorate, Wright Laboratory, Eglin Air Force Base", January 22, 1997, pp. 19-20). Also, I can't stop thinking about Controlled Demolition, Inc., being involved in the cleanup of both, Oklahoma City and WTC. Waco, what can I say? When you have a woman Attorney General who looks and acts like a man, bad things happen. I wish women politicos would act more like women instead of imitating the alpha-male archetype. We would have less problems all around. Great question as a follow up to Waco, Mike. Next time I'm in the Himalayas, I'll check on that for you. Can't help you there. I think we should look into ourselves for answers to our problems. Too many people relegate that duty to some other entities, and the result is the mess we're in. Do you care about Obama? What should Americans be caring about, knowing about, that we don't know about or care about right now? I have no hope whatsoever in Obama. I don't trust 95 percent of the people he's surrounded himself with. I think Obama is less transparent than Bush, more intelligent, and therefore much, much more dangerous. Besides, anybody who wins an election because of a Soviet-style propaganda poster is suspicious to me. I hope I'm wrong, but somehow I don't see Obama pulling a JFK while in office. Americans should study very carefully what every member of the Obama Administration represents. And then, take to the streets. Which means, "Good morning, darling." It's in Czech, and I'm Polish, but I like the Czechs. I think they're smart and charming, which is a great combination. This interview. But it's already past 1pm, so I'm late. 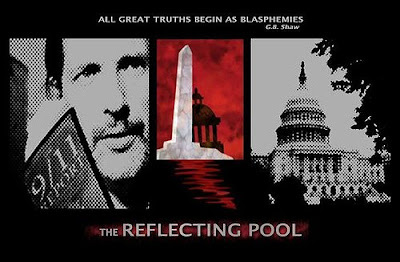 Pay back all the debts I incurred while trying to tell the truth with "The Reflecting Pool," so I can get the IRS off my back. What else would you like to add? What else should I have asked? You did a good job. I would like to add something positive at the end, but I'm out of material at the moment.